Whether it's a gift for your sweetheart (your partner) or a treat for your own sweet heart, Aromatherapy products with essential oils have amazing effects on your heart, mind and physiology. Such gifts of nature go much deeper than a superficial scent. They have an abundance of therapeutic benefits, nourishing and uplifting your mind and body both through your sense of smell, as well as through the application on your skin, some of which will be absorbed into your body. What better gift can you give, other than the gift of health and joy! Some of my favourite floral essential oils are featured here together with their therapeutic benefits and related products containing these oils. Rose has long been a symbol of love and purity. The petals were scattered at weddings to ensure a happy marriage. Whether or not you have a partner, rose is very uplifting and healing for your heart - your physical heart and your emotions. In Aromatherapy, rose oil is used for its relaxing, antidepressant, and tonic properties, and for healing the heart, emotions and treating gynaecological problems. In skincare, it is often used for dry, sensitive or aging skins. 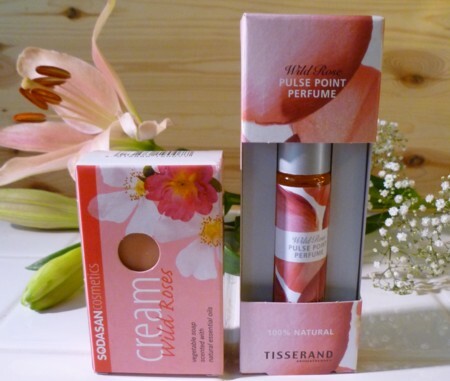 My Favourite Rose Scented Product: Tisserand Rose Pulse Point Perfume - a really lovely rose perfume which smells like it contains a high percentage of rose. It has a roller ball top which you apply to your pulse points, a simple method of treating yourself to the healing properties of rose. It comes in a pretty pink box and makes a lovely gift. 10. 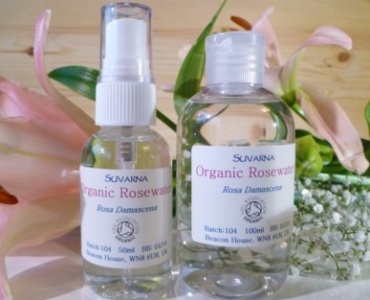 Organic Rosewater cooling soothing gentle skin toner sometimes helpful for itchy skin. 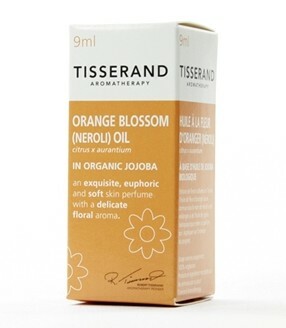 Orange blossom (neroli) oil is one of my favourite essential oils. In aromatherapy treatment it has both uplifting and relaxing qualities, and is used to treat depression, stress and anxiety. Neroli has a rejuvenating effect because of its powerful cytophylactic properties, which means it encourages the growth of healthy new cells. This is helpful for anti-aging because the rate at which new cells reproduce is slowed down with age. Neroli is gentle on the skin and used in skin care products for sensitive skin. Precious Moroccan Orange (Neroli) Flower oil gives a delicate floral, slightly fruity scent. Orange blossom brings a sense of peace to the mind, as well an uplifting effect on the mind and emotions. In a base of jojoba oil, it can be used to massage into your wrist and neck. A cream with a pleasant scent of neroli which is suitable for sensitive skin. 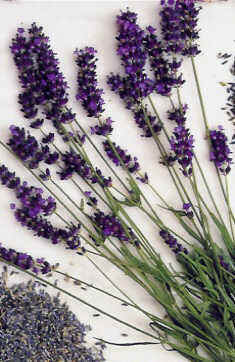 Beware of products with pretty pictures of flowers, but which haven't got any flower essence in them. They contain artificial chemical perfume which doesn't have any therapeutic effect, and may even be detrimental, as these get absorbed into your body. We don't sell any artificially perfumed products as we believe they are harmful to your health.
" People from a planet without flowers would think we must be mad with joy the whole time to have such things about us."